Last week I asked if you liked to check out Other People’s Bookshelves. You responded by saying: 1. Of course! and 2. Let’s check out each other’s bookshelves. 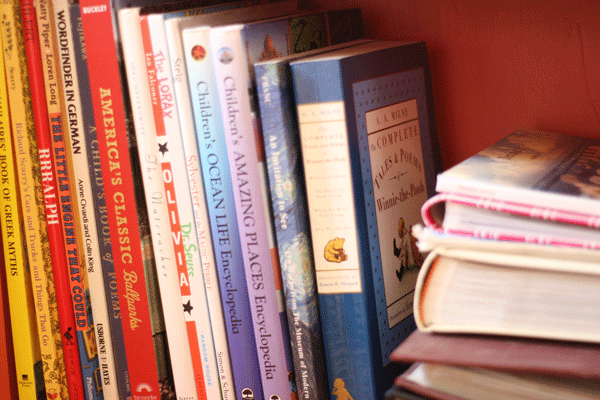 So today, you’re invited to share what’s on YOUR bookshelf. Write a post on your blog, link up an instagram photo, or email me your info at modern mrs darcy at gmail dot com. 1. Take a picture (or a dozen). 2. Write up a list of your favorite titles. 3. Describe where you store your books. Now on to my bookshelves: despite being a huge bookworm, my bookshelves aren’t amazing. My current reads ( there might be 30 of them at any given time) and the favorites I refer to often live in haphazard stacks by my bed, the staircase, and our coffee tables. But my largest and best-maintained bookshelf is in my living room. Most of my books live in the basement, but I still claimed about half the space here for my books. This top shelf includes recent reads I loved, books I refer to often, and books I’d like to re-read. I like the visual reminder that I could read German once (I’m not so sure I could today) from the yellow lit books and Bridget Jones, and besides, they fit on this short shelf. This shelf holds more of the same: recent(ish) reads and ones I’ve referred to lately, plus a few of my favorites: Dallas Willard’s The Divine Conspiracy, Jane Austen, Richard Foster’s Prayer, Buechner, Oscar Wilde, and my collection of out-of print 1950s devotionals. I stick books I’ve been meaning to read here so I (hopefully) remember to actually read them. These are my oft-referred to cookbooks: including Ina Garten, Pam Anderson, Well Fed 1 and 2, a splattered and stained Joy of Cooking. We adore The Food Lover’s Companion–it’s the reference book up top–and pull it off the shelf at least twice a week during dinner conversations. This shelf holds stacks of library books, the Narnia collection we’re reading aloud as a family, and a few reference books. That skinny blue one is The Elements of Style, and it always reminds me how much I’d love a whole shelf devoted to writing books. This shelf holds chapter books: Winnie the Pooh, Betsy-Tacy, Little House, the Shoe Books, and American Girl all live here (when they don’t migrate to my kids’ bookshelves). 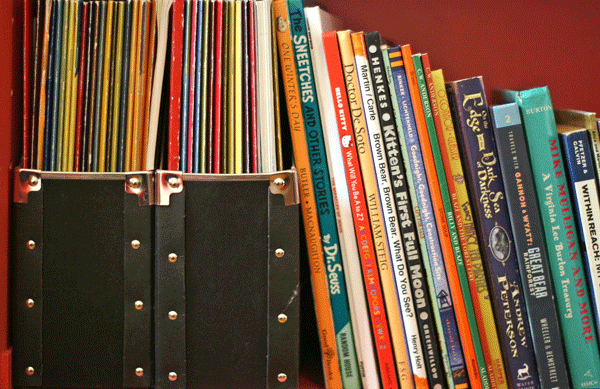 Here we have books for beginning readers–Frog and Toad, Alexander, Maisy, Curious George, Caps for Sale–books my youngest two can flip through independently or read aloud with a parent or older sibling. (My parents brought Bonsoir Lune back from Paris–it’s my favorite.) The stack on the right is for 3-year-old Silas: we keep his Thomas books here, at his eye level, for easy access. Here we have tall hardback favorites and family photo albums that my kids love to flip through. The last shelf holds more kids’ books and my Cook’s Illustrated collection, which doesn’t fit anywhere else. That’s what’s on my bookshelf. I’m sure one day I’ll share pictures of my cluttered stacks, which are a lot more interesting. To see the bookshelves I’m dreaming of, check out my book storage and display board on Pinterest. 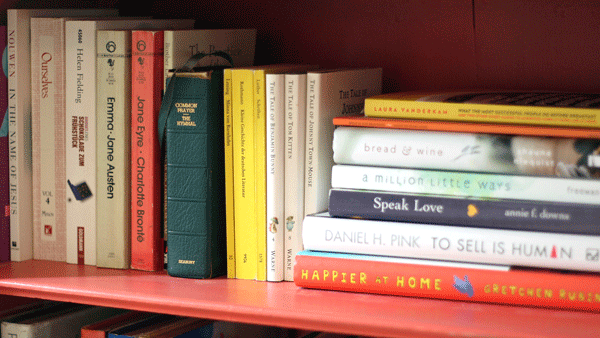 It’s your turn: what’s on YOUR bookshelf? The link-up will be open until November 19 at midnight EST. 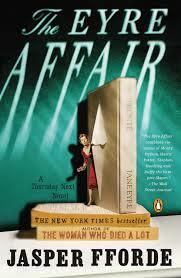 Next:Twitterature: November 2013 edition. With a sad library story and a kid’s cookbook review. 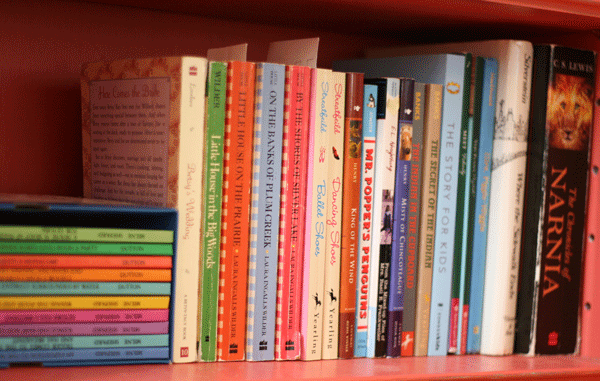 I love your shelves, and seeing all the Little House books all lined up makes me so, so happy! Your shelves reminded me of how I’ve been meaning to pick up Buechner for about 15 years (which one is your fav??) and that I forgot to add Michael Pollen’s In Defense of Food to my own list of favs. Whistling in the Dark is the one that I’ve held on to, but I’ve only read a handful by him–it doesn’t seem fair to pick a favorite based on only that! I also absolutely adore the color of your shelf! I’m kind of in awe of your bookshelf – makes me want to do a better job with my shelves and get something on display in our main living areas besides the kids’ books- but then at my kids’ ages, if it’s on display it’s fair game – thus why they currently live where little hands don’t reach! I absolutely get that! When I was straightening these up I was struck anew at how different our bookshelves look now that our youngest is three instead of two or under! 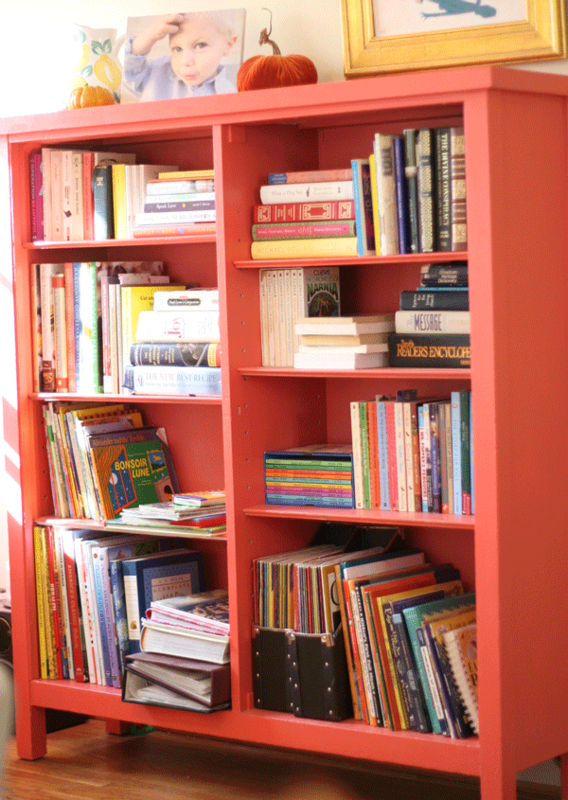 I love the colour of your bookshelf! And it looks so nice and neat, love the French version of Goodnight Moon. 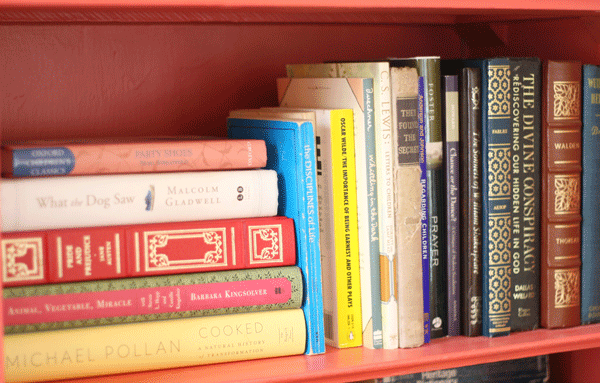 Love the color of your bookshelf! 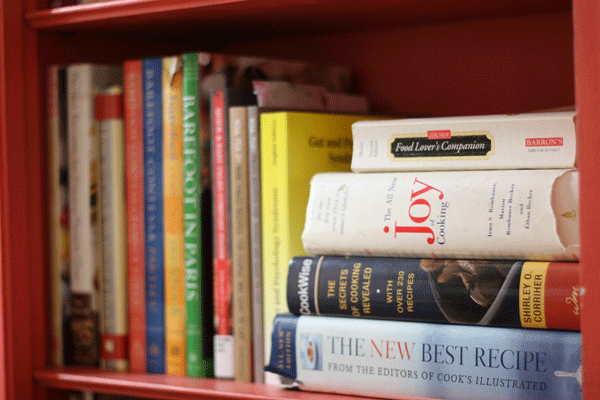 I have some more cookbooks to add to my collection on my Christmas list this year. I want a Barefoot Contessa book, but not sure which one. Thanks for hosting the link up! That pretty red bookcase makes me happy! Note: I can only put books above toddler height. I still have one in the dumping books stage. This is so great! I got my camera out to take some shots and read this: “WARNING! BATTERY EXHAUSTED!” Sigh. Maybe later today … but in the meantime I’ll enjoy these links. I love your Little House books and all the other kids’ books. Ooh, Mike Mulligan — how many times did my brothers & I read that as kids! I told Adriana (Classical Quest) that I was going to take a picture of a dictionary and explain that since it has all the words used in all the books, every book I have is contained in it. No need for any other pictures, right? Yeah, she wasn’t all that impressed with the idea either. Ya, well, my dictionary does not contain your favourite word, “bloviator.” Stupid Webster’s. If my dictionary is missing a word, I feel free to add it in the margins. Oh Anne I love the Cook’s Illustrated! 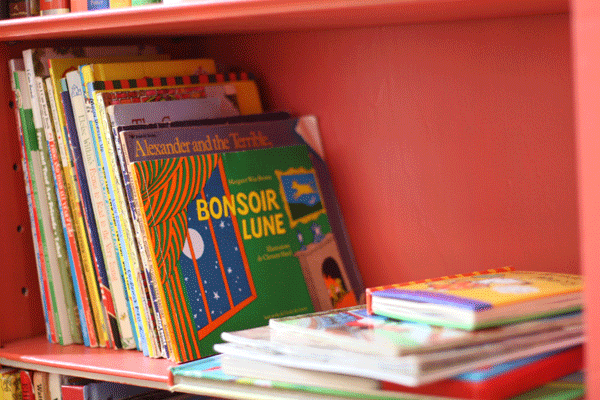 And all of the children’s books – so refreshing. My children age one and nearly three are notorious for shredding books. Sigh. So our bookshelf is in our bedroom, but I really want it to be in the living room. We keep the board books available to them at any time and a select few picture books are available to the nearly three year old, in her room, out of baby reach. I’ve been looking forward to this all week! Thanks for organizing. Now to clear my schedule for the rest of the day so I can browse all the stacks. So fun! I’ll link up and show my (rather messy) office bookshelves on Friday. “Kleine Geschichte der deutschen” what? I can’t read the titles of the German ones. Those little yellow books are SO SILLY, except since they’re basically student editions, it makes sense for them to be small and cheap. Loving all the children’s books, too. I spy Shel Silverstein! And all the Cook’s Illustrated…swoon. Literatur! Of course. I could make out the L but kept thinking it said Lehrer which just didn’t make sense. Taking notes for the next time I visit. I linked up my bookshelf tour from a couple of weeks ago- will try to add a note about your linkup later. Hope that’s OK! 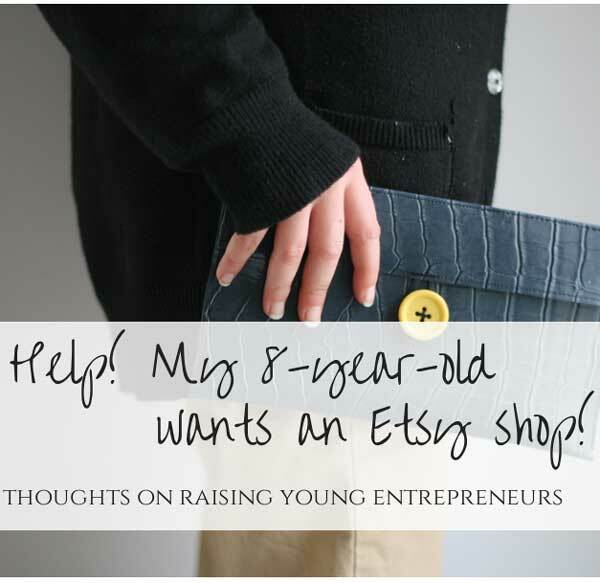 Anne, Writing this post came at a perfect time for me. Spending time with my books is so healing for me and I honestly needed a little soul joy. Also, this was quite possibly the favorite post I have ever written, and I am excited to keep it going a bit as about 10 of my friends and family members who don’t blog but read like crazy sent me pictures of their bookshelves to put up in another post on Friday. So, thank you, thank you, thank you! Thanks for sharing all your books! 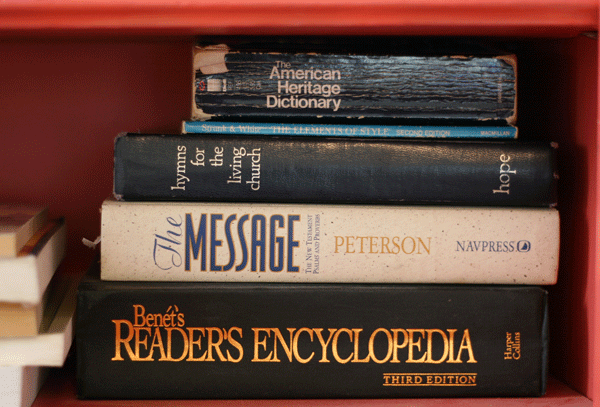 I think books on bookshelves can tell a lot about the person that owns and displays them. So fun to see your shelves and all of those that linked up! Ohhhhh, you knocked this out of the park! I’m enjoying reading through your shelves, and taking a peep at folks who’ve linked up. Isn’t it funny how more than one of us describe our books as “living” somewhere? Mine “live” in the basement. Yours “live” beside your bed. Books do live in a way, don’t they? The really great ones grow and change with us. Anne, that’s a beautiful bookcase. I put up a link to ours. I love your bookshelves. What a fabulous collection. If I could only own 1 children’s book, it would be Goodnight Moon. Thanks for hosting such a fun link-up. Thanks, Anne, for hosting this link-up. I visited a lot of bookshelves over the last few days, and though I only commented on a few blogs, I just wanted to say that it is still amazing and wonderful that people still read books! As one blogger mentioned, this does not even account for how many books are on her Kindle, too. So, keep on reading!! What a fun idea! 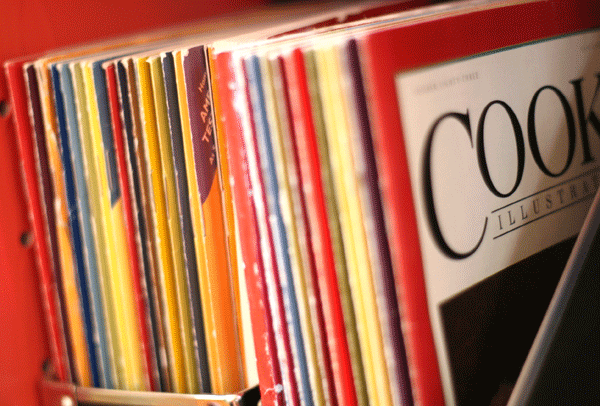 I have been meaning to put my Cook’s Illustrated collection into magazine holders FOREVER. I just can’t seem to find ones I love…maybe I’ll hit Pinterest and just make my own! Mine are bare-bones IKEA … but my standards are low. 🙂 I love the idea of making your own! Don’t hesitate to ask necessary questions, before an informed choice over a carpet cleaner. when employing a commercial cleaning company.